SLSA President Graham Ford, Rob Stokes, MP for Pittwater and the winning NSW team. SLSA Photo. 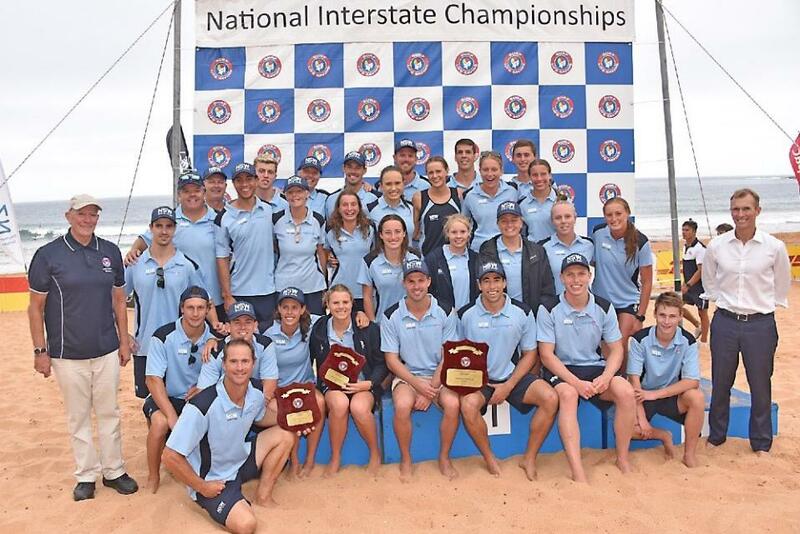 Surf Life Saving NSW has taken out both Divisions of the 2019 Interstate Championships held on Newport Beach Thursday, January 24th. The win makes this a back-to-back victory for the teams. The NSW Pathway Cup team, led by Newport's Joel Piper as Captain, amassed 214 points, from Queensland (197), SA (117), Victoria (114), WA (110), Tasmania (50) and NT (7). Queensland led New South Wales by two points as the afternoon events commenced but strong teamwork by the Opens and Youth Teams secured a good margin by day's end. Captain of the NSW Open's Team Mitchell Trim praised the whole team - ‘’Everyone did their bit in the water but Max (Brooks) and Emily (Doyle) were great. Emily was unreal and she did so many events, ’’ Mitchell said. At the end of the 2019 Interstate Championships President of Surf Life Saving Australia Graham Ford thanked Newport SLSC and the volunteer officials for hosting a great event. A traditional competitors march, followed by the official opening from Jason Falinski MP, Member for Mackellar and Michael Regan, Mayor, Northern Beaches Council signalled the start of the 2019 Surf Life Saving Australia Interstate Championships, at Sydney’s Newport Beach today. The key to NSW’s win lay in their calculated approach to today’s racing. It was their strategic selection of choosing additional male and female beach athletes and their tactical approach to the relays that saw them win eight of the eight relay events. The clever use of the power plays late in the day with Sam Zustovich and Blake Drysdale earned them 26 points for the team and this, together with the stand out performances from Jay Furniss, Jackson Borg and Emily Doyle contributed to NSW’s 35 point triumph. The Queenslanders were not to be dismissed fighting hard throughout the day showing strength in the female events with wins in the Open Female Board, Surf and Beach Flags and Youth IronWoman, Ski and Beach Flags as well as winning three out of the four Taplin Races. Lani Pallister outclassed the field all day in ideal swim conditions with standout performances from fellow Queenslander’s, Cooper Williams, Adam Palmer, Ruby Nolan, Hannah Sculley and Grace Gurr. South Australia hit the score board with drafted athlete Britney Pierce claiming gold in the Open IronWoman race and WA gained their key points with wins in the Open Male and Female Beach Sprints with Sophie Watts and Jackson Symonds claiming victory in both events. Leading NSW athlete, Jay Furniss, said it was the comradeship and sportsmanship within the NSW team that added to their win. “We all worked together and aimed to not make it about any of us winning individually – it’s just about getting points for NSW. Usually you race for the first spot but in this case, we were happy that we did it for the team and it paid off and we’re stoked with the result,” said Furniss. After successfully wrestling the title of Interstate Champions back from fierce rivals Queensland in 2018, the NSW team had plenty of reasons to smile after defending their crown on home turf at Sydney’s Newport Beach on Thursday. In a display of skill and tenacity across a broad range of surf sport events, the home team proved too strong in the overall standings finishing the competition on 289 points well clear of both Queensland (259) and the third placed West Australians (168). Pleasingly for the NSW side they were able to soar to the summit in both the Youth and Open categories on the back of not only some outstanding individual results but also great success in the relays in which they were able to finish in the top two in every event. There were a number of key performances on the day from NSW competitors with Jay Furniss, Emily Doyle, and Jackson Doyle making key contributions on the water, and Sam Zustovich and Blake Drysdale shining on the sand. It was, however, a team effort with every member of the squad contributing to the overall victory. “The NSW Interstate team this year is awesome as we’ve got a really good mix of debutants and athletes who have been in the team 3-5 times before,” said Head Coach Jimmy Walker. Umina’s Jemma Smith who just a few short years ago was a youth competitor and is rapidly becoming one of the more experienced heads in the squad said the Interstate competition is something that every athlete looks forward to throughout the season. “It’s always exciting to be able to come down to the Interstate Championships as it’s a great indication to see how you are faring against some of the best athletes in the country,” said Smith. “To me it’s a huge honour to represent NSW as you are not only representing your teammates, your club mates, but the entire state and it’s a great honour and something that I always look forward to doing throughout the season. “We’ve got a really strong youth team and it’s great that the youth team gets to come up and race us in the opens while it was also exciting the Youth Pathway Cup team raced alongside us at the same beach for the first time as it really adds to the event,” she said. After being invited to send an Open Team to the 2018 event in South Australia, this year NSW Country were able to field a full squad for the first time. Despite finishing in 5th spot (158 point) there were a number of very encouraging results produced by Country team competitors. “We’ve had the Trans-Tasman Series so we’ve been together for a long period and then the new guys coming in are all locals and know each other,” said Head Coach Scott McCartney. “The best part of our team is they all race for each other and when they do they achieve things they didn’t think was possible. The talent has always been there in Country NSW and I think will always be,” he said. Alex Rampoldi (North Cronulla SLSC), Chloe Mannix-Power (Cronulla SLSC), Naomi Scott (Manly LSC), Jemma Smith (Umina SLSC), Lizzie Welborn (North Bondi SLSC), Madison Spencer (Newport SLSC), Jackson Borg (Newport SLSC), Max Brooks (Newport SLSC), Mitchell Trim (Newport SLSC), Dean Scarff (North Bondi SLSC), Jay Furniss (Manly LSC), & Blake Drysdale (Newport SLSC). Isabellah Walker (Cronulla SLSC), Madison Louw (Newport SLSC), Nicola Owen (Redhead SLSC), Emily Doyle (Newport SLSC), Leah Rampoldi (North Cronulla SLSC), Georgia Sinclair (Wanda SLSC), Sam Zustovich (Mollymook SLSC), Zach Morris (Newport SLSC), Noah Havard (North Bondi SLSC), Hugh McAlpine (Newport SLSC), Jamee Smith (Wanda SLSC), & Bailey Johns (Avoca Beach SLSC). Some outstanding individual results and a strong team first culture helped ensure that the Youth Pathway Cup would remain in the hands of NSW for at least another year after a successful competition at Sydney’s Newport Beach on Thursday. From start to finish the Baby Blues were in outstanding form as they shrugged off the pressure of being inaugural Pathway Cup winners in 2018 to cap off what was an outstanding day of surf sport for the home state after the NSW State Team were also crowned champions. The Youth Pathway Cup offers an opportunity for some of the most talented athletes across the Under 14 and 15 age groups to test their skills against the best in Australia. All mainland states were represented this season with Tasmania too crossing the Bass Strait for their first attempt at the event. NSW fielded an exceptionally strong team with the vast majority of the squad having won state or even national medals, while a handful of the U15 competitors were able to utilise their experience after backing up for a second straight campaign. In what is sure to have historians reaching for their books this NSW team also named two sets of twins in the one squad from the one club. Newport’s Mitchell and Jake Morris and Katelynn and Kimberley Doyle were all in action in the U14 age group. It was a successful day for NSW who ended the competition in first place on the overall standings with 214 points ahead of Queensland (197) and South Australia (117). In fact so impressive was the performance from this talented NSW team they finished in the top three in every single one of the 38 events contested. The final record will show that NSW competitors achieved 26 first place finishes, 10 second places, and two third placed finishes in what was an outstanding display of consistency. On the water the team was led by some fantastic individual performances from Kimberley Doyle Doyle, Lily O’Sullivan, Mitchell Morris and captain Joel Piper, while beach counterparts Emelyn Wheeler, Lucy Flanagan, Joshua Gedz and Peter Thoroughgood all powered through their events. The team then capped off the day with a number of outstanding races in the relay events which were enough to ensure that they would be lifting the trophy by the end of the competition. Team Manager Monique Williams said it was a fantastic result that reflected the hard work that the athletes had been putting in. “When they came into camp over the last few days they really put a lot of effort into their training. What was really impressive was the way they put everything aside to focus on putting the team first as we had Mitchell Trim who is the NSW Open Captain and Jemma Smith herself an experienced athlete now come in and give a talk to reinforce just how important it is to be part of a team. “I am really proud of what everyone achieved throughout the competition and there is so much talent in this team and I believe that they will certainly be making a case to be included in future representative teams,” said Ms Williams. Head Coach Rachelle King and Williams have been part of the campaign for the past two seasons and are keen to ensure that success in the Youth Pathway Cup for NSW continues into the future. “Rachelle has done an amazing job first as an assistant coach and now as head coach in her own right. Two from two is a great start and we definitely both will be back and trying our best to help us get that third win,” said Monique Williams. U14s – Mia Cracknell (Avoca Beach SLSC), Chelsea Jones (Bulli SLSC), Emelyn Wheeler (Terrigal SLSC), Katelynn Doyle (Newport SLSC), Kimberley Doyle (Newport SLSC), Joshua Gedz (Freshwater SLSC), Charlie Walker (Cooks Hill SLSC), Bailey Clues (Newport SLSC), Jake Morris (Newport SLSC) & Mitchell Morris (Newport SLSC). U15s – Poppi Lever (Macmasters Beach SLSC), Lily O’Sullivan (Cudgen Headland SLSC), Lucy Flanagan (North Cronulla SLSC), Lily Finati (North Bondi SLSC), Holly Holmesby (Bulli SLSC), Daniel Chisholm (Swansea Belmont SLSC), Ryan Green (Terrigal SLSC), Lucas Ottaway (Bulli SLSC), Peter Thoroughgood (Elouera SLSC), & Joel Piper (Newport SLSC). Head Coach - Rachelle King (Terrigal SLSC), Team Manager - Monique Williams (Cooks Hill SLSC), Assistant Coaches - Michael Gedz (Queenscliff SLSC) & Thomas Simpson (Shelly Beach SLSC). After successfully ending their title drought in South Australia last year the NSW team are gunning for back-to-back Interstate trophies when the nation’s largest representative surf sport carnival gets underway at Newport Beach on Sydney’s Northern Beaches this Thursday. The venue does hold happy memories for NSW with the blues enjoying success at the same beach back in 2015. In fact that would be the last time they held the trophy for two summers with their Queensland rivals besting them despite the best efforts of the NSW contingent. NSW have named an experienced team with captain Mitchell Trim, and Ironwomen Jemma Smith, Lizzie Welborn, and Namoi Scott among a host of big names. The Youth team too boasts plenty of exciting talent with many already earning medals on the national stage. There is a strong sense of togetherness in the squad right with many of the senior team having cut their teeth as junior athletes. Head Coach Jim Walker who is about to take the helm of his third campaign is excited about the challenges that await his squad. “I think we’re in really good shape with many of our athletes recording superb results for their clubs over recent weeks. “Having it in Sydney is a good advantage for us with most of the team having raced at Newport many times over the years,” said Jim Walker. The coach is feeling confident about the chances of his charges and is looking forward to renewing the battle with his Queensland counterpart Dean Mercer. “Dean is a very competitive coach and so am I. It’s going to be a lot of fun. We’ve got a very experienced team with almost 50 state campaigns in the group. “I think most pleasingly for us is we’re a true blood team. All of our athletes race and patrol at NSW beaches and they have a lot of pride in their state, and that will help get us over the line,” he said. In addition to fielding teams in the Open and Youth Divisions NSW will also be fielding a Country team. This is a fantastic opportunity for athletes outside the Newcastle-Wollongong corridor to gain representative experience at the top level. Last year NSW Country sent an Open team to the South Australian capital and this experiment was such a success that is has been expanded to include a youth team. The 2019 Interstate Championships takes place at Newport Beach on Thursday 24 January. Action gets underway from 8am AEDT. Youth Division - Anthea Warne (Cudgen Headland SLSC), Paige Leishman – (Cudgen Headland SLSC) Hayley Smith – (Cudgen Headland SLSC), Claudia Crawford – (Cudgen Headland SLSC), Brooke Cavanagh – (Warilla-Barrack Point SLSC), Cahrizma MacDonald - (Cabarita Beach SLSC), Nathan Mackenzie – (Lennox Head-Alstonville) SLSC, Joseph Warne – (Cudgen Headland SLSC), Finn Askew – (Tacking Point SLSC), Hugh Stewart – (Wauchope-Bonny Hills SLSC), Will Jones – (Byron Bay SLSC) & Sam Zustovich – (Mollymook SLSC). Open Division - Jordan White – (Warilla Barrack-Point SLSC), Maddie Bakker – (Warilla Barrack-Point SLSC), Sofie Boyd – (Cudgen Headland SLSC), Chloe Jones – (Cudgen Headland SLSC), Mahli Borham – (Cudgen Headland SLSC), Kate Lewis – (Mollymook SLSC), Luke Chaffer – (Cudgen Headland SLSC), Angus MacPhail – (Cudgen Headland SLSC), Kai Onley – (Cudgen Headland SLSC), Josh Jones – (Cudgen Headland SLSC), Brock Scrivener – (Mollymook SLSC), & Jayden Allen – (Warilla Barrack-Point SLSC). After enjoying stunning success at the inaugural event in 2018, the state’s top teenagers are putting the final touches on their preparations to defend the Youth Pathway Cup later this week. In 2019 the event will be staged at Newport Beach on Thursday 24 January with Surf Life Saving NSW acting as the host organisers. The event will be held concurrently with the Interstate competition and will conclude a huge day of surf sport on Sydney’s Northern Beaches. For most of the team it will be their first time pulling on the sky blue surf cap of NSW, and the selectors have chosen the squad based on their ability as well as their versatility on the sand and in the surf. Many of these athletes have already achieved exceptional results at State and Country Championships in the past and this competition exposes them to a higher representative level as they seek to build their career in surf sport. Following the success of last year’s competition Tasmania will cross the Bass Strait and join the 5 mainland states in fielding a team to compete at the Youth Pathway Cup. The NSW squad entered camp today with Head Coach Rachelle King looking forward to what promises to be an exciting title defence in just over 48 hours. “I’m really looking forward to getting everyone together. It’s the first opportunity we have had to get the team together since it was selected late last. “We have a beach/ocean session today, and I’m looking forward to our final preparations of our relay teams and team combinations. “It’s a fantastic opportunity for the group to race other athletes their age from around Australia and see where they’re at before participating at the Aussie Champs in April,” Ms King said. U14s – Mia Cracknell (Avoca Beach SLSC), Chelsea Jones (Bulli SLSC), Emelyn Wheeler (Terrigal SLSC), Katelynn Doyle (Newport SLSC), Kimberley Doyle (Newport SLSC), Joshua Gedz (Freshwater SLSC), Charlie Walker (Cooks Hill SLSC), Bailey Clues (Newport SLSC), Jake Morris (Newport SLSC) Mitchell Morris (Newport SLSC). U15s – Poppi Lever (Macmasters Beach SLSC), Lily O’Sullivan (Cudgen Headland SLSC), Lucy Flanagan (North Cronulla SLSC), Lily Finati (North Bondi SLSC), Holly Holmesby (Bulli SLSC), Daniel Chisholm (Swansea Belmont SLSC), Ryan Green (Terrigal SLSC), Lucas Ottaway (Bulli SLSC), Peter Thoroughgood (Elouera SLSC), Joel Piper (Newport SLSC).